I arrived in Pennsylvania with a heavy heart, which I talked about a little in my birthday post. I was really looking forward to time away from crazy busy normal life. Time to think. Time to sort some things out. Time to get reacquainted with myself. Help came in a very unexpected way. From the moment we met, I knew I liked Mark. He came out of the barn, dressed in a farmer's uniform--well-worn t-shirt and jeans and dirty boots. Refusing to shake my hand because he'd been in the barn, he kindly interrupted his evening milking to show me and the kids our home for the next three weeks. 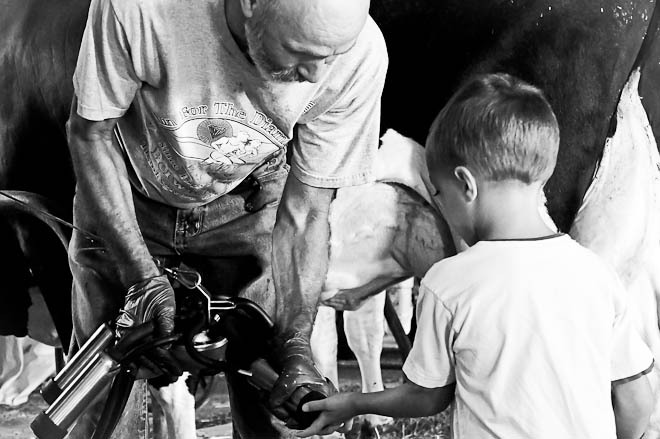 Every day I would see him around the farm, always working on something--driving the tractor, moving cows, cleaning stalls, preparing the gallons and gallons of milk twice a day. Only once did I catch him sitting for a moment on his back porch, a Gatorade and sandwich on the table and the newspaper in his hand. One day I offhandedly mentioned how I'd love to let the kids get a chance to milk a cow while we were there. "I'm in the barn between 6:30 and 7 every morning," was all he said. Two mornings later, I had all the kids up and dressed and ready to milk cows. 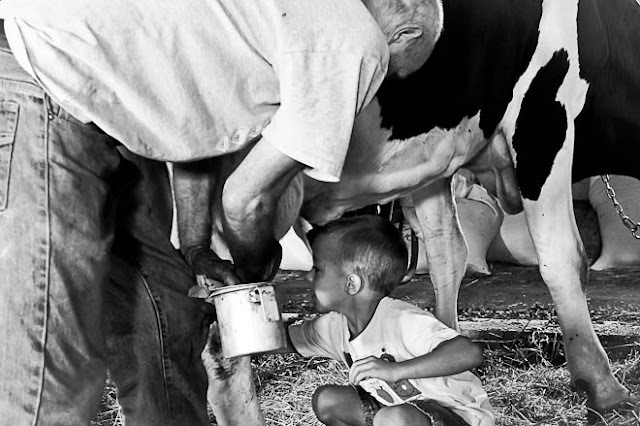 In my mind, I thought he would line them up, let each kid have a chance to pull an udder, then resume his work. But this was the man who had surprised us with a new swing seat just days earlier, so this quick approach wasn't in his plan for the morning. Instead, Mark helped Lily, then Micah, then Hyrum glove up and spray a cow's udders with a light disinfectant before beginning the process. 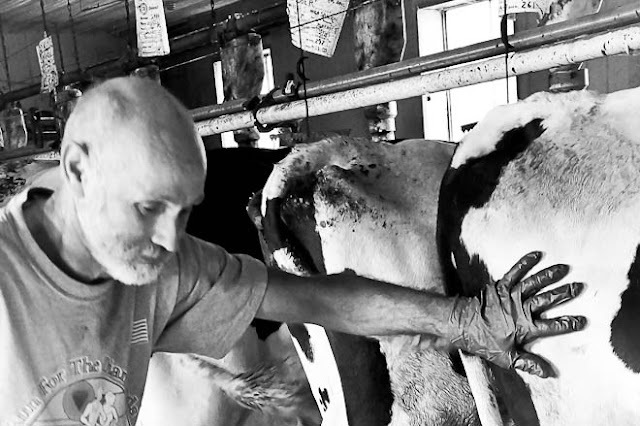 After the udders were clean, they would prime them by squirting a little milk into a tin can from each teat. 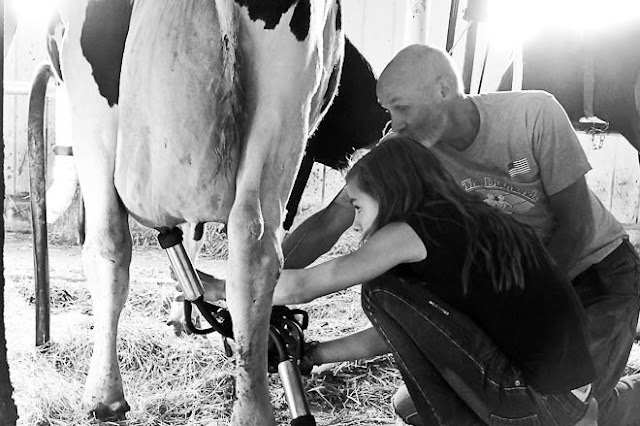 When the milk was flowing, Mark would show them the mechanical milking machine, let each of them feel the suction, then he would assist them in attaching it to the cow. 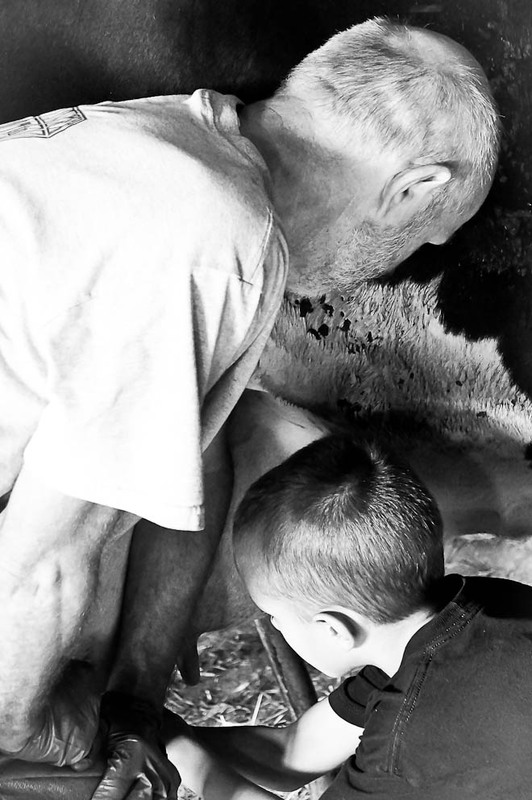 My kids exploded with happiness from each new piece of the process--being that close to a cow, stilled by Mark's gentle touch, touching the udder and feeling the milk flow, hearing the SLLLLLP as the milking machine began its job. It was an exhilarating experience for each of my children, but I'm sure it took much more of Mark's morning than he anticipated. Never once did he make us feel like we were intruding. Never once did he step in to hurry up the process. 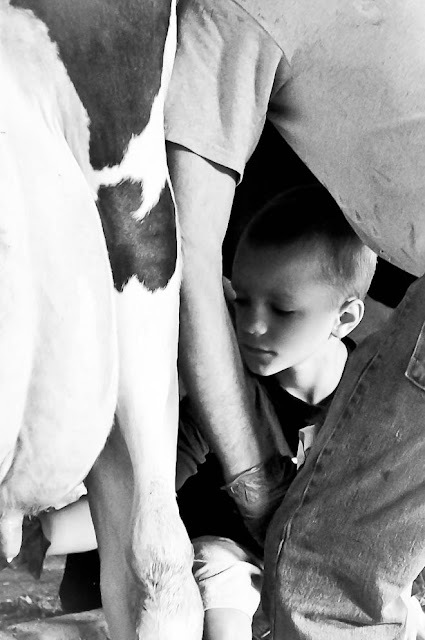 Never once did he lose focus on the cow and the child. I watched this unobtrusive, kind man many times over the next few weeks. I wandered into the barn often, needing to surround myself with its familiar sounds and smells. Whenever Mark was present, he would stop what he was doing to answer my questions or talk about life on a Pennsylvania farm. I was fascinated by his wisdom and his experiences--from farming to family to the history of his beloved Wyalusing. One particular day is forever imprinted in my memory. Lily came bounding in the house, exclaiming that another mama was in the calving pen, ready to give birth. We were excited and we all trundled down the hill to witness another miracle. An hour stretched to two, and still Mama was lowing and pacing and miserable. Mark's daughter was in town visiting, and she was in the pen assisting her dad, holding Mama's head and talking quietly in her ear, "Good girl. You can do it, good Bossie" over and over and over. Two hours turned to three, and Mark's demeanor changed. He knew something was wrong. Never once did he ask us to leave or make us feel like we were in the way. Occasionally he would explain what was going on as he tried to assist Mama in getting her calf out, but he stayed gentle and calm through what was quickly becoming an emergency. When he pulled out his cell phone to call the vet, I knew things were dangerous, so I walked the kids back to the house, bathed and jammied them up, read them a story, then headed back down the hill to the barn. I rounded the corner to find Mark stretched out on the grass in the dusky evening light, with his eyes closed. I asked about Mama, and he told me the vet was at least 30 minutes away, and there was nothing to do until he got to Shumhurst. Instead of panic and stress and worry, all of which I'm sure he was feeling, Mark was outwardly calm and had surrendered to the limits of the situation. The vet finally arrived, but all of us knew it was too late for the calf--all of their energy was now focused on saving the life of the mother, and that was my cue to disappear and let them work. Without getting too graphic in my description, Baby was eventually removed and Mama was okay, much to Mark's relief. How I wish I could express how Mark changed me. In my rushed, hurried life as the mom of many children involved in many activities, I rarely take time to just BE . . . enjoy the lessons of life, learn from my children, teach them things I love, stop and listen to them. Mark wasn't trying to be a great philosopher as he went about his life, working and working all day, quietly creating a beautiful and serene corner of the world. I will never forget who he was, and what he taught me during those few short weeks. 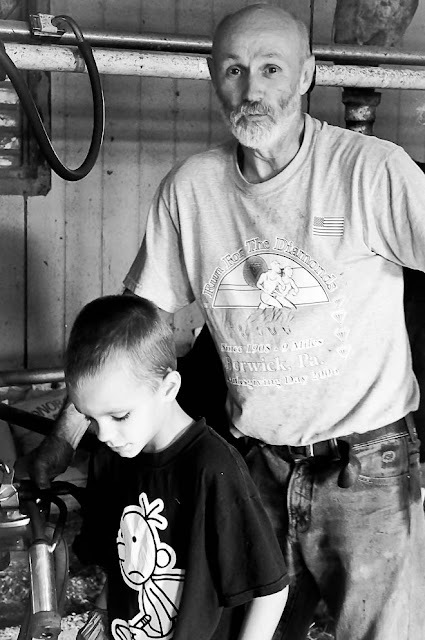 My trip to Pennsylvania--farm life and unexpected wisdom from the example of a quiet unassuming farmer. What wonderful wisdom you brought back with you. Thanks Jen. That trip was a gift to your children...and to you, too. Mark sounds like a born teahder.What a fabulous experience for your kids! Sometimes I wish I could just go back to that life and I have tried to replicate here in my little corner of the world. 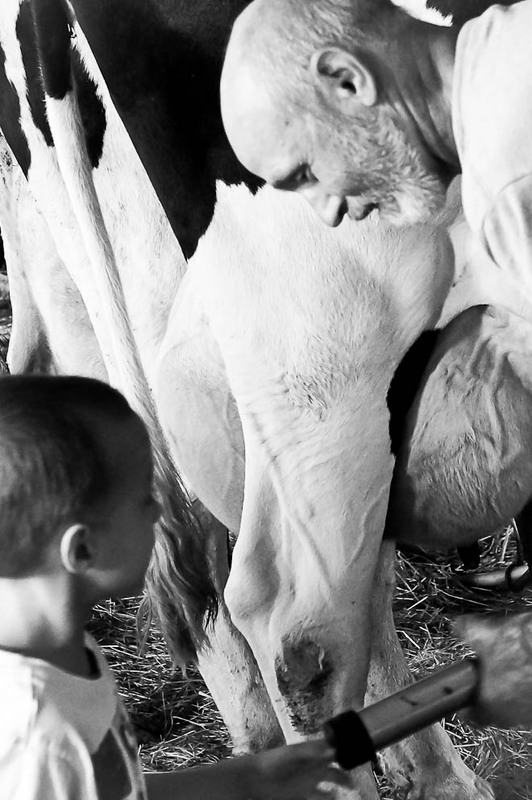 Caring for animals is an amazingly peaceful activity. I hope you can find peace and happiness. I read your birthday post and can relate, only the year that I felt all of that was my 56th year. The best life lessons are learned this way! What a great experience! U is also for Udders right! What a lovely, true story. Makes me wish I knew Mark, too. Your kids will remember this trip forever. Love, love, love this post and the words of wisdom. Thank you. A well told story Jen. What a great experience for your kids. What an awesome experience. He sound like my grandpa who was a dairy farmer too. that is just beautiful jen!! and such an important lesson. thanks for the reminder friend. Thanks for stopping by to say hello. I read your birthday post also. I must say my forties were a busy time for me as that is when I had my first and only child (I can only imagine how hectic life is for you)...but when I turned 57..well then I felt all those things you wrote about. Now at 58 I have figured out a way to let myself shine...to be...it is a path that only you can forge...but be patient and kind to yourself along the way...God is at work in a most wonderful way. What a great post! I loved your black and white photos that illustrated so well your words. ...I used to milk cows long ago. awww, that sounds like a wonderful experience and he sounds very sweet. i'm glad that it was so positive for you! What a wonderful, wonderful post. Again, I find myself tearing up. It's so wierd. Mark is truly a gentle giant. Weird, he somehow got so much older all these years later. hahahaaha Once again I am SO glad you got to have this experience. an amazing and unforgettable experience for you and your children. I am here with a lump in my throat and tears in my eyes! I'm glad you met Mark! I suspect he loved meeting all of you as well!